Bike problems are a given on a cycle tour, we get that. But our second cracked rim became something of a real pain in the ####. 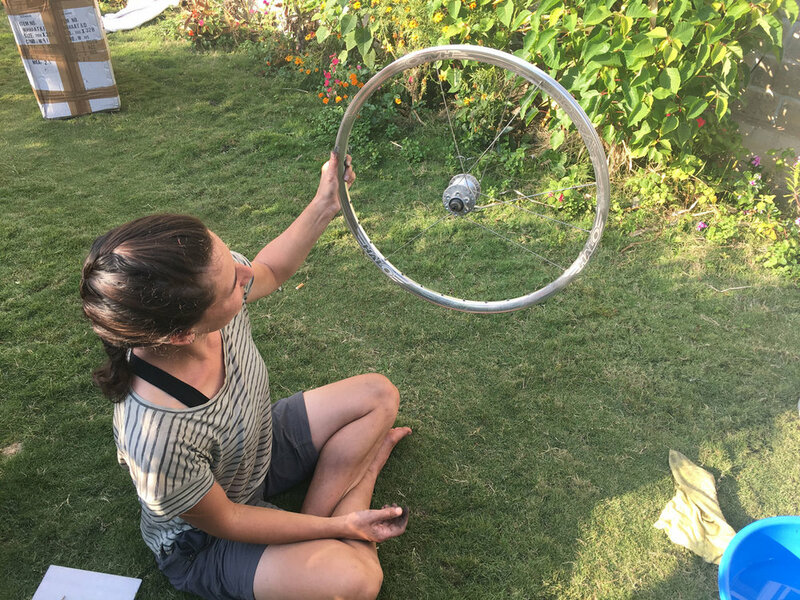 Not only did it force us to rent me a mountain bike for £140, leave the Annapurna Circuit early, and reluctantly order Dan a new wheel (third time is not a charm), we also had to collect the wheels in person from Kathmandu airport customs and pay a stinking VAT bill. Rewind back to Annapurna. Cycling without a care in the world, we assumed the new wheels would be in Pokhara when we finished the circuit. 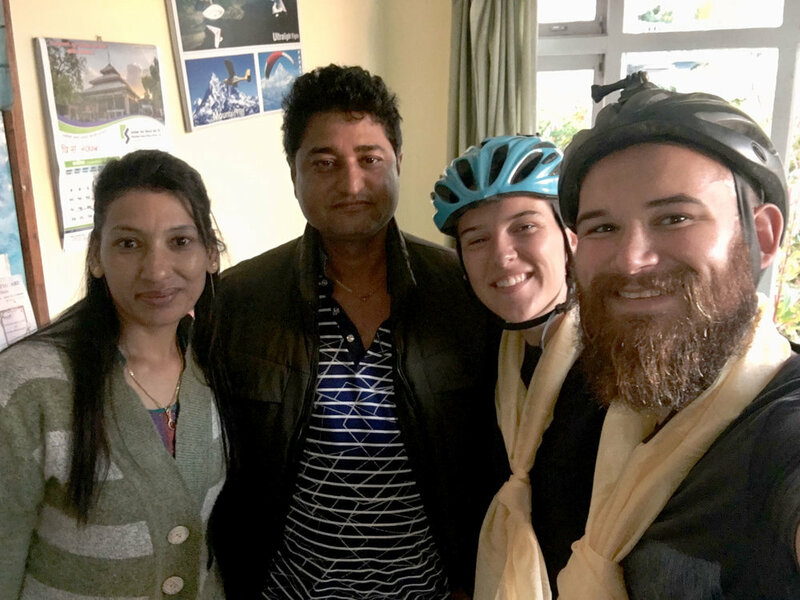 While we were riding high, however, we received an email from Dev at DHL Nepal saying there had been a problem: our wheels were stuck in customs. His instructions over email were terrible – sorry if you ever read this, Dev, but they were. The way he described the situation, it sounded like he was handling it, since he’d asked for passport copies etc. It took over one week for him to clearly state that we had to go to Kathmandu airport customs in person to collect the wheels, despite having paid DHL to deliver them to Pokhara, which is 200km from Kathmandu. He also seemed to think that we would be VAT exempt if we could prove that we were on a world tour. Again, Dev, bad communication. As soon as we realised that Dev was doing a whole lot of nothing, we left all of our gear in Pokhara and bussed to Kathmandu. Eight-hours later, we were back in the dustbowl that we have spent far too much time in. We’d arranged to meet Dev the following day at 11am at the DHL offices. In person his English was spot-on and his instructions were so clear. Although he wasn’t so helpful. He said the situation was completely out of his hands now. He handed us all of the paperwork and left us to fend for ourselves in the dog pit that is the Nepal customs department. Don’t worry though, he did offer to courier the wheels to Pokhara once we had collected them in person. Thanks, Dev. Nepal. Customs. Is. So. Corrupt. Naively we were still under the impression we’d get away without paying the 40% VAT. When we finally found the right building and a guy that seemed to understand our problem, we argued our case. It went something like this: we have paid 20% UK VAT, we are on a world cycle tour, the wheels are leaving Nepal in a matter of days. It didn’t work. He was adamant that we had to pay the VAT bill. We asked to speak to his manager: The Chief Customs Officer. Airport customs is just one big warehouse full of corruption. I should point out here that the wheels are £300 each. According to Nepal VAT, we were looking at a bill of £240. This guy was offering to reduce that bill considerably. I’m not going to lie, I was tempted. While I asked the guy how he’d go about pulling this heist off, Dan did some quick sums. The guy told me that he would scan our customs notice and cover the value fee. Then he would manually correct it and scan it again. Hey presto, your wheels are now valued at £100. We’d then only have to pay £40 to customs and a little backhander to the guy. It was at this point Dan said we wouldn’t actually save that much money. Dan worked out that if we could get the 20% UK VAT back, like Cloud 9 Cycles had already mentioned, we’d effectively only be paying 20% Nepal VAT. That’s £120. Now he put it like that, was jail time for tax fraud really worth the £80 we would have saved? I still wanted to do it, but Dan said no. And so began the saga of trying to process our wheels through customs the legit way, which was ridiculously harder than the dodgy way. The first guy lost interest in us once we refused his offer, so we had to find someone else. I reckon we spoke to fifteen different people before someone actually started processing our customs clearance papers. Three of them offered us the same bribe at varying prices. All of them couldn’t believe we had paid so much for two wheels. They were also convinced that we were collecting a bicycle. Trying to convince them otherwise wasn’t helped by the fact that somewhere along the delivery line the weight was listed as 29.8kg. Imagine having two wheels, minus tyres, weighing 14.9kg each! Five stressful hours and £240 later, we left the customs warehouse with our new wheels and made a mad dash for the eight-hour bus back to Pokhara. Let’s get these bad boys on the bikes! Everything cost money to clear customs: the guy who filled in the forms, the blue paper it was printed on, storage of the wheels as we had taken one week to collect them. It was a joke. All of that for these. For bike nerds, we’ve switched from a Halo Vapour 32 hole rim with aluminium Hope Pro 4 hub, to Ryde Andra 30 36 hole rim with steel Hope Pro 4 hub. The next day was wheel day. We were keen to try our Next Best Thing 2 tool, which has stayed untouched since we bought it. It’s a tiny cassette remover, which replaces a heavy chain whip, spanner and cassette locking tool. It uses the frame as leverage to loosen the cassette. After struggling with it for a half hour, we then read online that you should actually use a chain whip etc to remove your cassette for the first time, as it’s usually super tight and you run the risk of damaging the frame. Oops. We popped to the bike shop we rented the mountain bike from to borrow their tools. Dan waited outside and I ran in. On my way out, I passed an old white guy who’d heard our dilemma. When he spotted me with the tools, of course he made a sarky comment. “Ooo some little lady strength?”. Yes sir, some little lady strength, and if you’d have come to watch, you’ll have seen that it was, in fact, my little lady strength that removed the cassettes and refitted them, while Dan cleaned all the components. God bless that bike maintenance course work paid for before I left. We disassembled the old wheels as we’re going to sell the old Hope hubs. A complete wash down. A clean cassette is so satisfying. As if that wasn’t enough for one week, we had one monstrous journey from Pokhara in Nepal to the state of Gujarat on the west coast of India, where the Indian leg of The Slow Race begins. Before I tell that tale, I’ll explain why we’re heading directly to Gujarat, rather than cycling from the border. The simple answer is that India is big. As we’re only here for three-months, time is precious, so we need to spend it wisely. 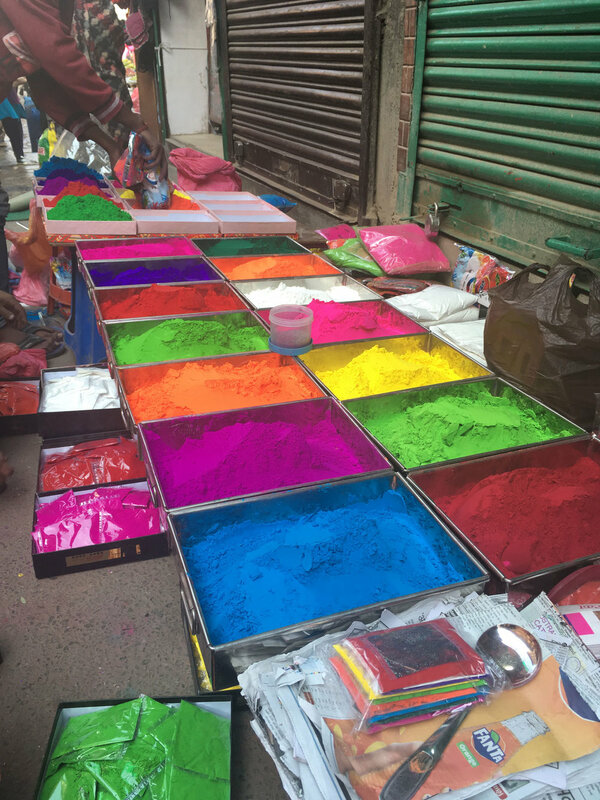 Since Dan has already been to India and ticked off most of the ‘must-sees’, he left me in charge of the route. His only stipulation being that he’d like to spend some time in the north and some time in the south. He did offer to visit the main sights again, but I wanted it to be as new for him as it could be. The south was easy to plan. We’d have time to cycle from Goa on the west coast to Chennai on the east, hugging the coastline for most of the way. 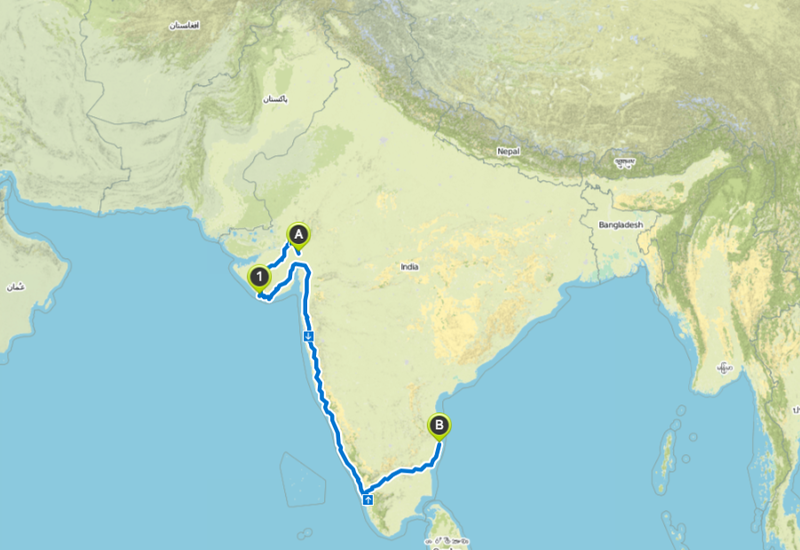 After reading a few blogs, this ride sounds surprisingly peaceful and easy for India – and includes lots of beach time. The north was a little harder. I listed lots of amazing things to see and grouped them by state. The idea being that we’d travel to one state and spend three/four weeks cycling around there before heading to the south. This is to avoid spending unnecessary time on buses and trains. The top contender was Himachal Pradesh in the Indian Himalayas, which is home to the Dalai Lama and the World’s highest road. But after spending a good month cycling in the Nepali Himalayas, we both fancied something a little flatter and warmer. Next on the list was Gujarat, with stunning stepwells and salt flats, plus it’s on the coast and close to the state of Goa. Sold. Our three-month plan. It’s around 3,400km with surprisingly 12,000m of climbing. Sonauli, Uttar Pradesh, where we entered from Nepal. And Ahmedabad, Gujarat, where we’ll start cycling. So. Back to the monstrous journey. With the itinerary sorted, we just needed to get to Gujarat. 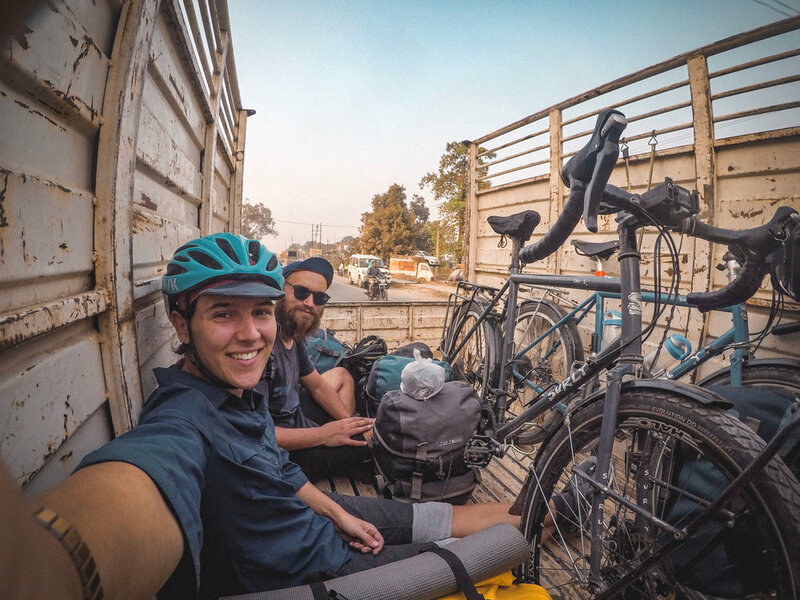 We had originally planned to cycle to the Indian border, then catch a train from the first main town. But when we checked the trains online, they were all sold out. We could only find one train to New Delhi on the 7th. We had no choice but to book it, which meant we didn’t have time to cycle to the border and had to bus for the third time in a week. We left Pokhara at 7.45am on Sunday, arriving at the border town at 5pm. On Monday we entered India, our twelfth country. At immigration, we met a local who told us there was a train from Anand Nagar to Ahmedabad (Gujarat) leaving at 7.30pm. Turns out he was wrong, but never mind. We caned 57km to the town to learn that no major train leaves from that station. The main station, Gorakhpur, was a further 50km. A ticket officer told us that there was indeed a train to Ahmedabad departing that evening at 10.30pm. We were lucky, as direct ones only run Sunday and Monday, and it was Monday. Perfect. Short on time, we tried to get a bus, that failed. A tuk-tuk, that also failed. We ended up hitching a ride in a pick-up truck. In Pokhara, we stayed at New United Hotel. It’s run by the most lovely family. They were so helpful during the wheel fiasco. After spending so much time there, it was quite sad to say goodbye in the end. They must have realised we’re pretty unlucky, as they gifted us with a good luck scarf as we left. After worrying about our bikes on the roofs of buses one too many times, we found the perfect transport for tourers. Ninety-minutes later we were at the station. It did get a little painful here. I could write a whole post just about this experience, but to save time – and your attention – I’ll just summarise. There were only four tickets left for the train. Essentially, we couldn’t buy the tickets until we got a thumbs-up about the bikes. But we couldn’t get a thumbs-up about the bikes until we had the tickets. In the end, the luggage guy gave us a note, which helped us get the tickets. Then, more annoyingly, we couldn’t put the bikes on the train ourselves. The luggage guy wanted us to leave the bikes with him. Dan was okay doing that, but I didn’t believe they would find the right train at the right time. The luggage department wasn’t even in the station! Tickets in hand, we dumped Dan and the twelve panniers on the right platform before I wheeled the bikes back to the luggage department and waited with them. Shortly after, a porter came along to collect them, who ended up getting into trouble as he allowed me to push one bike, while he pushed the other. He took us to a cabin on platform five, despite me telling him our train was on platform four. I was told again to leave the bikes. I couldn’t leave them now they were on the wrong platform – especially as everyone was prodding and poking them. They’d surely have a snapped cable by the time we were reunited. Thirty-minutes before departure, I asked again if I could take the bikes to platform four. I think the guys in the cabin got sick of me as they let me go. Not long after reaching Dan, a train pulled in; it was all systems go. I ran to the luggage carriage and D-locked the bikes to the shelving. Running back down the platform, I could see Dan urgently waving his arms. As it turned out, I had locked the bikes to the wrong train. Of course the train that arrived on our platform at our departure time wasn’t ours. I sprinted like Linford Christie back to the carriage and hurriedly undid the locks and cables, while visions of me being carted off to some unknown city flashed through my mind. Once I’d dragged everything off, there was an announcement that our train had been delayed by two-hours. Never mind. Come boarding time, the porter did find us again, as he had to load the bikes on himself. At least I knew they had boarded the right train in one piece. Ironically, it was me who put them on the wrong train in the end. The next thirty-three hours were spent hurtling 1,693km across India on two upper beds (if you remember on the Russian trains, one upper and one lower is the best combo). We arrived in Ahmedabad at 9.15am, seventy-three hours and thirty minutes after leaving Pokhara. What a relief to be stationary again. That should be public transport done for a while now; it should be a straight run to Chennai. Dan on his upper, tucking into his curry dinner, which cost £1.05. We actually really enjoyed the train, after the stress of getting on it. 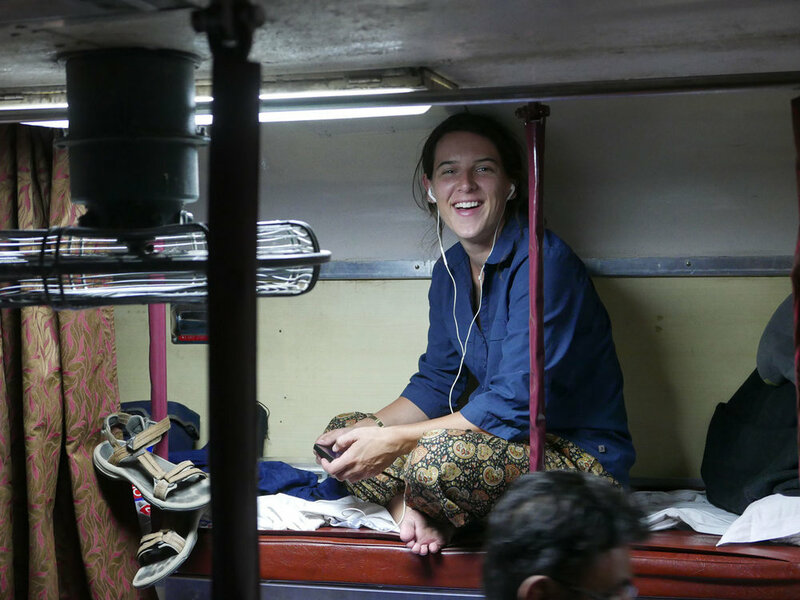 If we weren’t sleeping, we’d be listening to podcasts or sat at the open train door watching India whizz past (Healthy & Safety would have a heart attack). Another reason why we pushed to catch that direct train to Ahmedabad, besides it being the last direct one for five days, was that it meant we would be somewhere for Diwali. Diwali is the biggest festival in the Indian calendar. It’s the Hindu festival of light, which coincides with the Hindu New Year. Before making this direct train to Ahmedabad, we would have spent the 7th on a night train to New Delhi. Now we were in a major city. After checking into the seventh hotel we arrived at – three didn’t accept foreigners and three were beyond our budget – we wandered along the Sabarmati riverfront watching the fireworks go off across the city. It was a lovely end to a hectic week, accept for the fact that we couldn’t order a 90p beer we’d been looking forward to after crazy Nepali prices. As it so happens, Gujarat is a dry state. Trust us. Here’s to a sober few weeks.